Did YOU celebrate the big holiday yesterday?!! 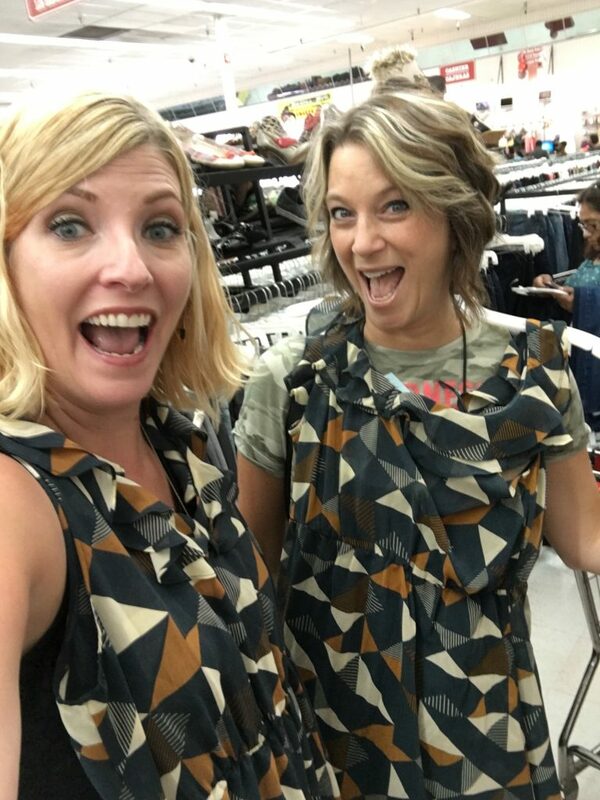 Okay, maybe it hasn’t achieved stat holiday status, but National Thrift Shop Day happens every August 17th and is a great excuse to head out for a little thrifting! That’s just what I did with my new friend Laurie, followed by festive bevvies (which in the blazing August sun of Houston means margaritas), so basically I had the best day ever! 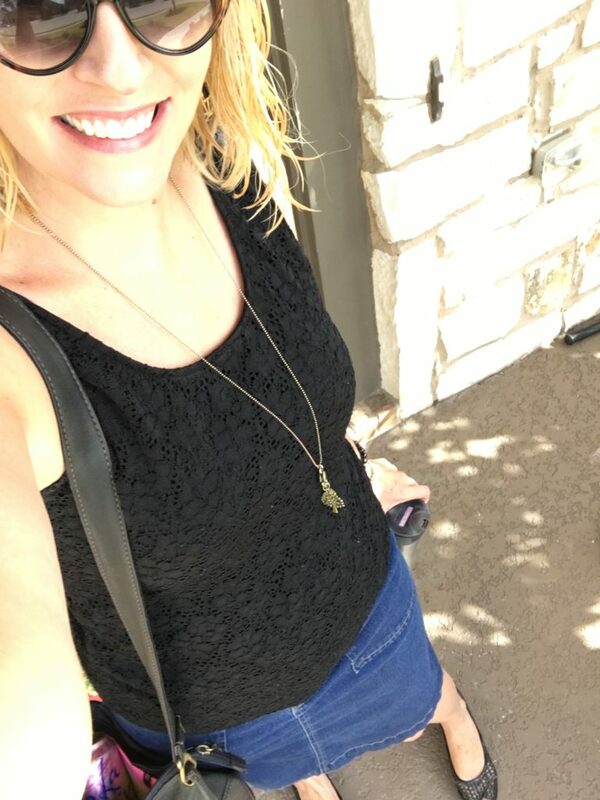 Wore my $2.50 Levis denim skirt, $6 Kenneth Cole tank, $9.10 Frye flats, $2.10 cat eye sunnies, and $21 Fossil bag. 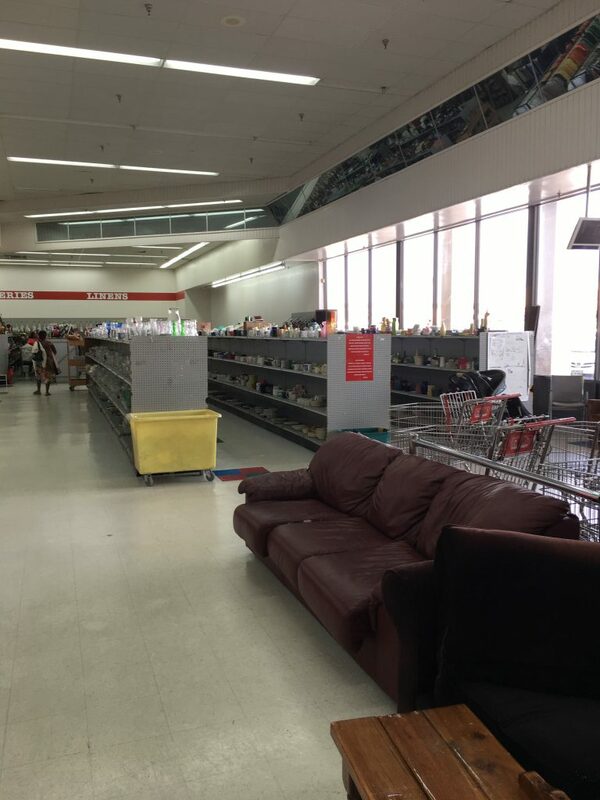 We went to Family Thrift Center, a different location from my inaugural visit. 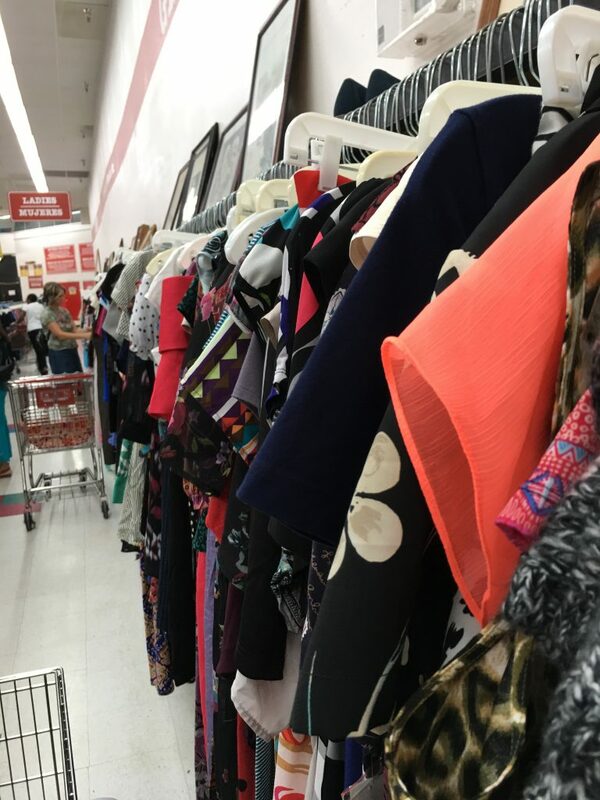 Turns out, this location works differently – items are individually priced, so not quite the same amazing deals but comparable to Goodwill, and everything is organized!!! 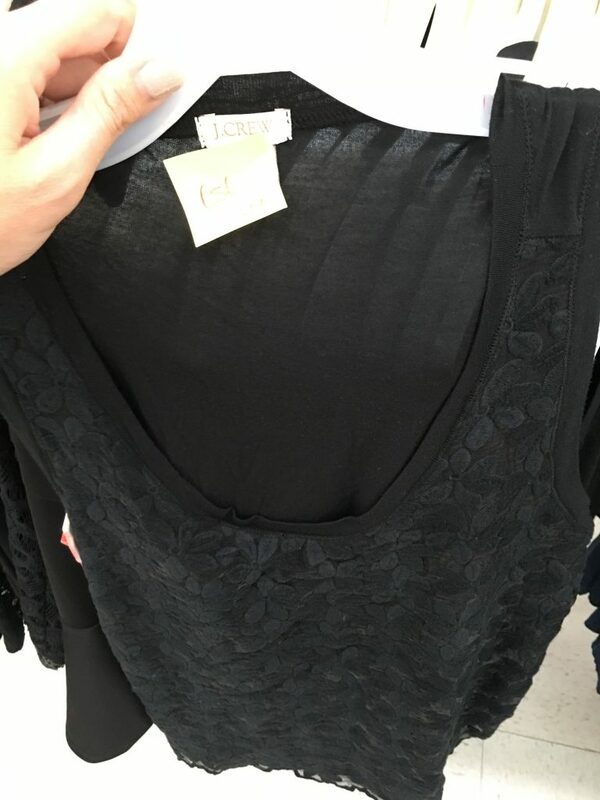 Similar to Goodwill, pieces are organized by colour in each section (women’s clothing, men’s, children’s, etc.). Laurie and I discussed the merits of this compared to organizing by size like Value Village. Ultimately, I am betting it’s a labour-saver to organize by colour. I didn’t even go to the housewares section but I WILL BE BACK for some giant-Texas-house decor. Lucky penny in the parking lot! There was a sizable shoe section and I spotted several good brands but nothing “amazing”. 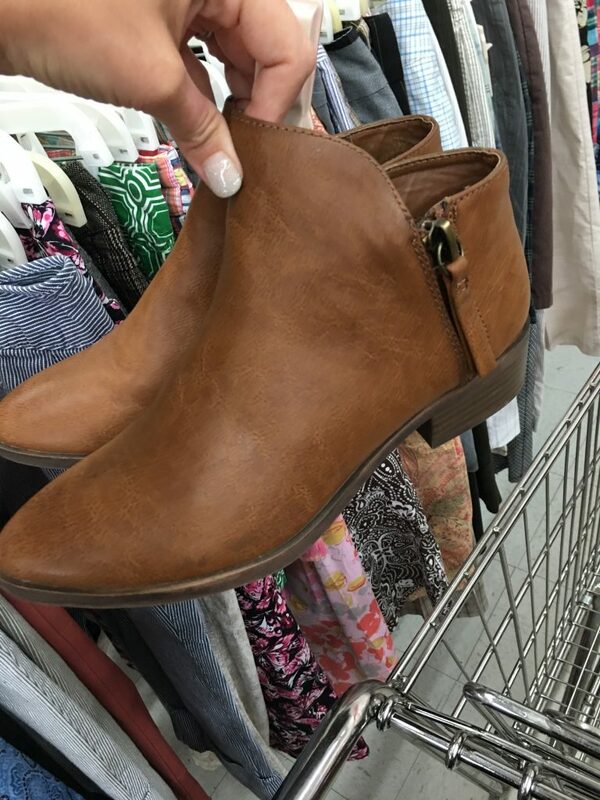 These Fergalicious boots were cute but not leather. Also, I’m hot, people. I can barely tolerate ballet flats right now. So I left them behind. 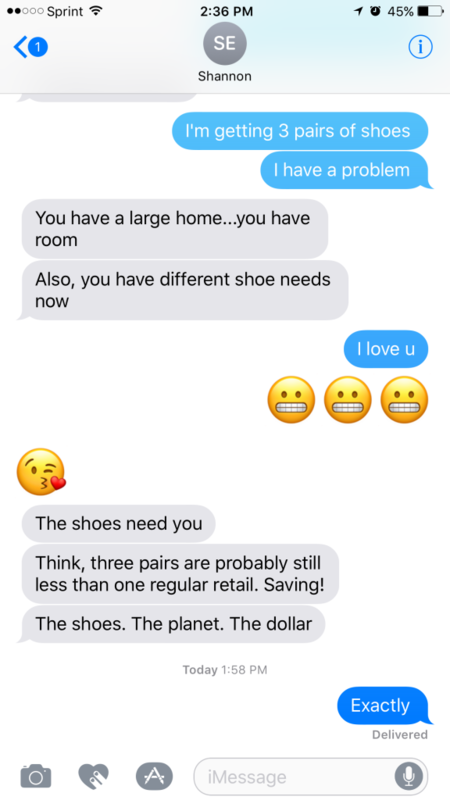 Most shoes were around the $7 mark. 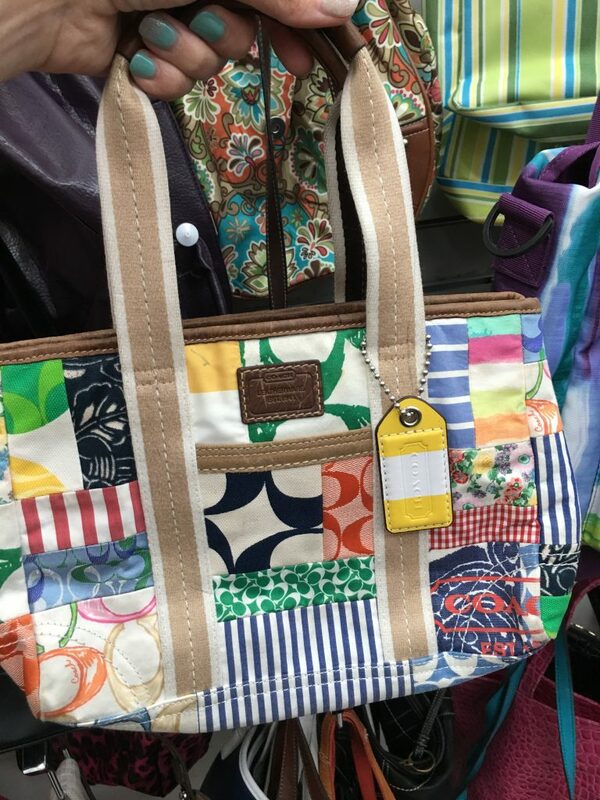 There was also a sizable bag selection! 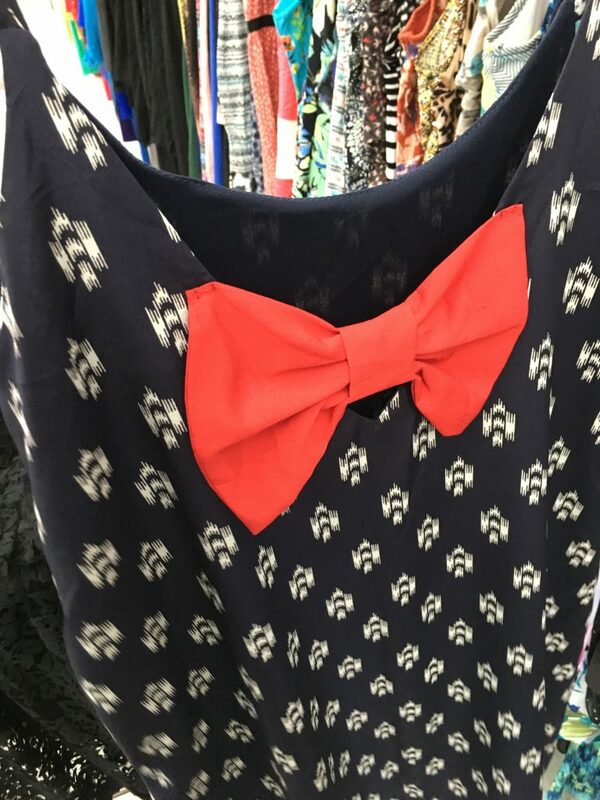 This one reminded me of the bag Pearls and Whimsy brought to our blogger gathering! 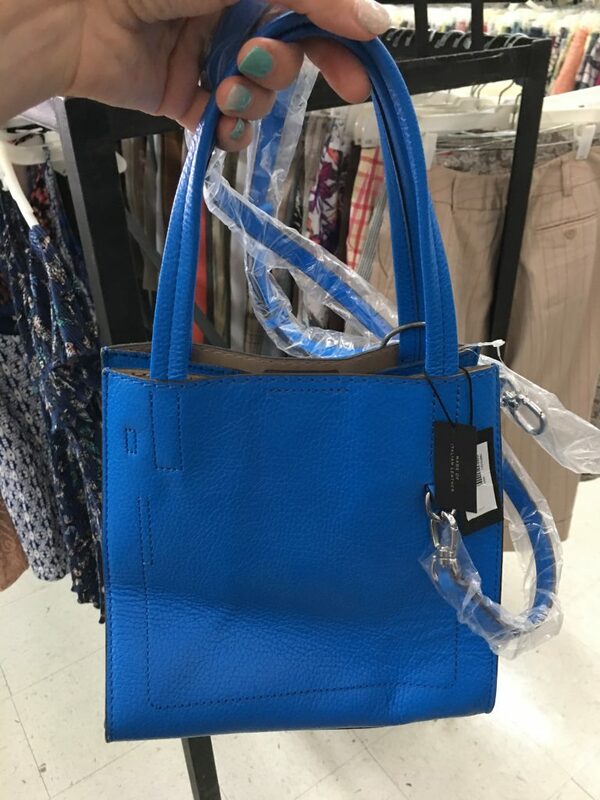 $9.59 for this NWT Banana Republic bag. Loved the colour but it looks like a lunch kit to me. Now we’re talking. 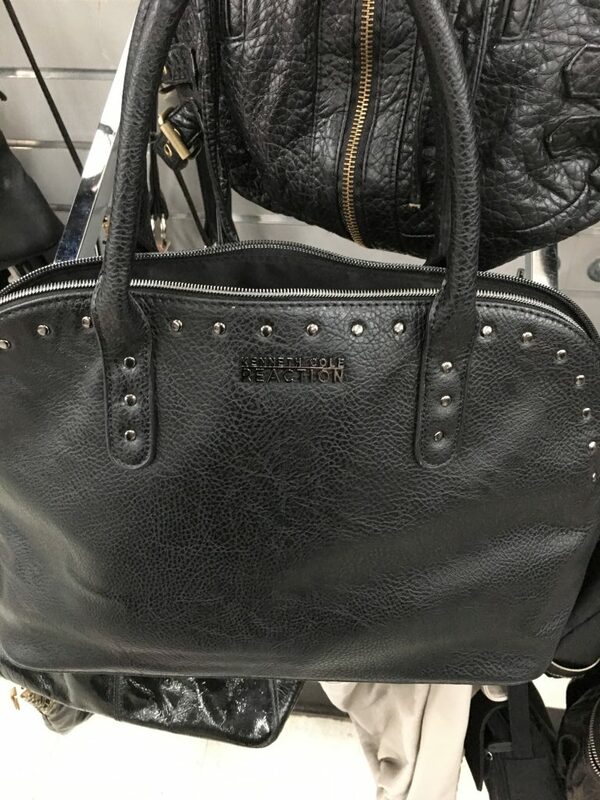 Not my style but Coach for $19.51 is a decent thrift deal. 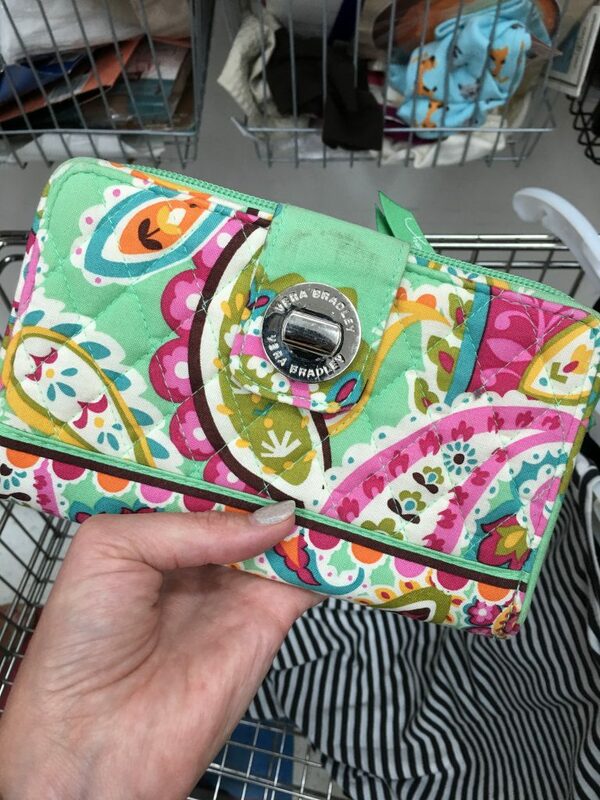 Vera Bradley wallet. Can’t remember the price but kinda wishing I had snagged it too because it was nowhere near the ~$50 price tag of a new one. 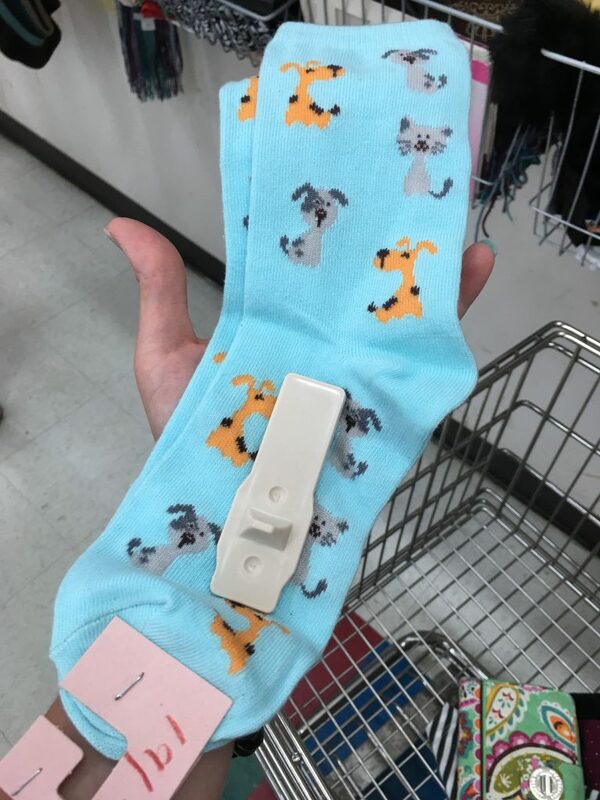 Did you spy these socks in the last shot? Super cute for that one time a year you wear socks in Houston. 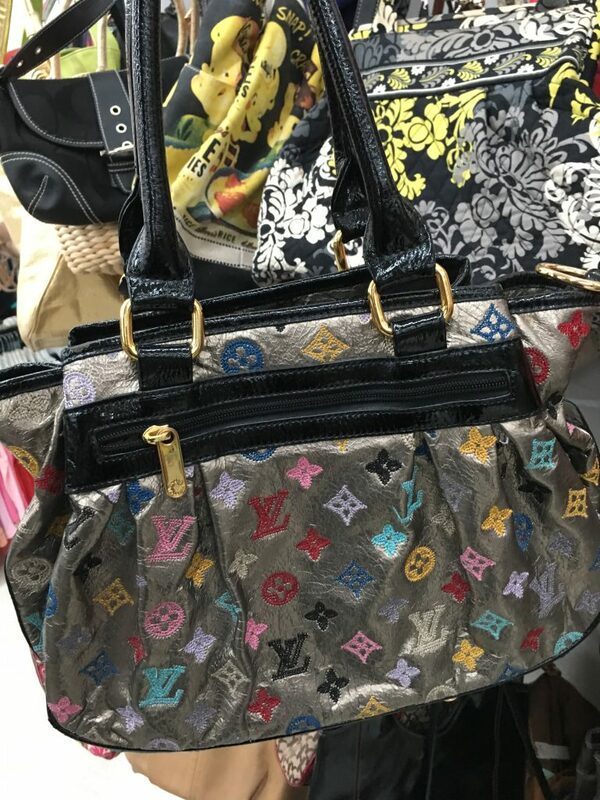 This Louis Vuitton was $5.45! Unfortunately the handles were ratched, which made me question the authenticity. But otherwise the hardware was marked and the quality seemed fitting. I’m sure you could replace the handles but I wouldn’t have a clue where to get that done here in Houston, so I passed. Any thoughts if it is authentic? 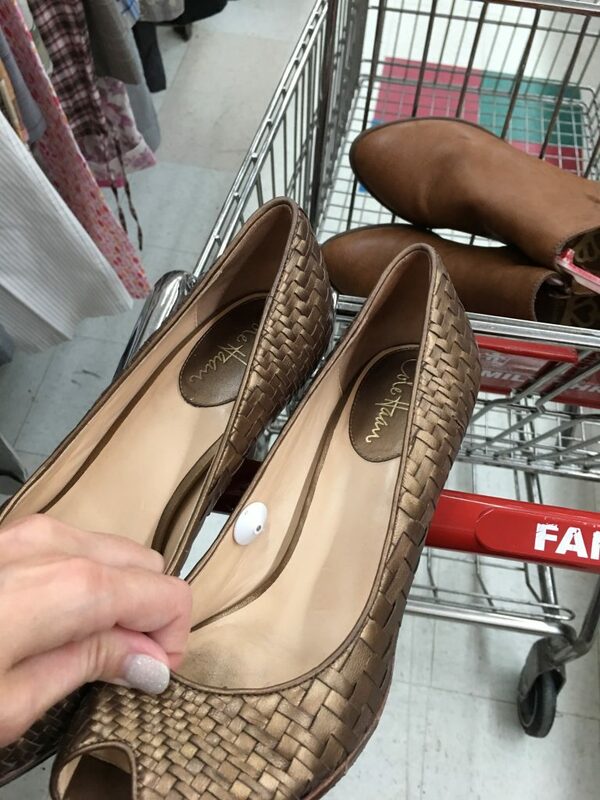 I find it hard to scan the shoes and clothing at the same time!! What?!! I don’t want to miss anything! I’m sure there were more designer brands to be had but I didn’t spot a ton. 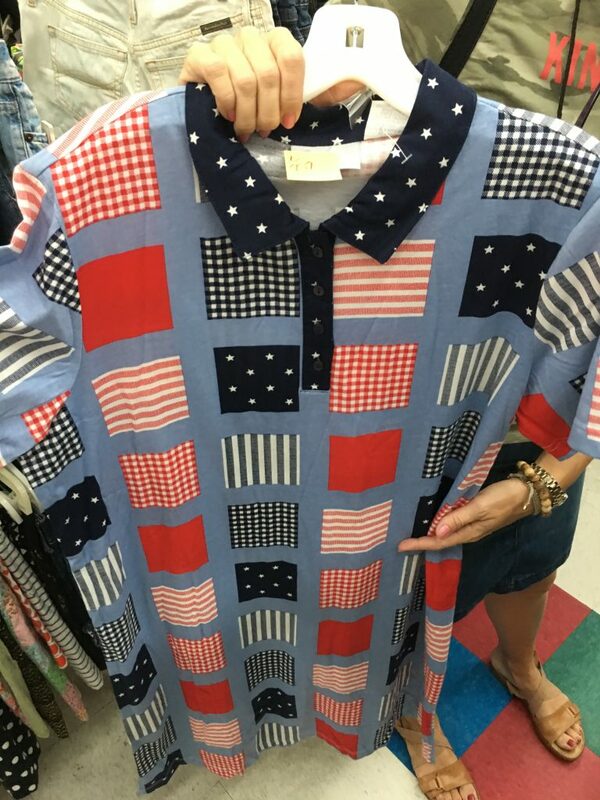 The prices were fair though – J Crew for $6.56. 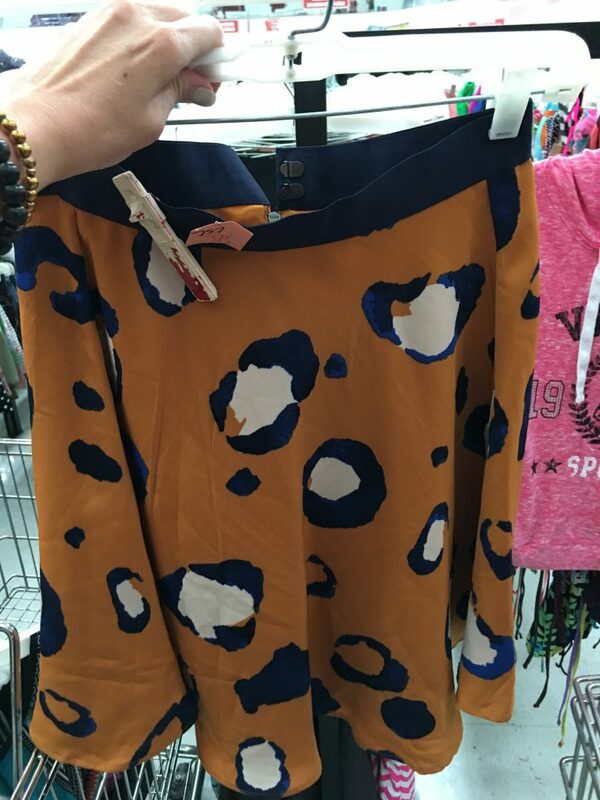 Here in the US, I am finding a lot more Target collaborations in the thrift shops along with Torrid and Lane Bryant, which I rarely saw in Canada. I think Adina has this skirt?!! 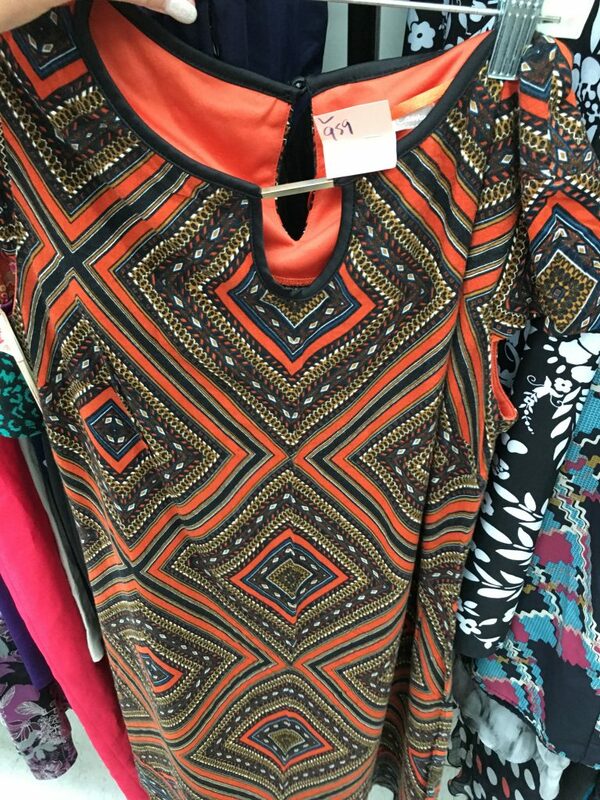 There were plenty of dresses to enjoy! Please congratulate me on my restraint. I was picky about putting anything in my cart that wouldn’t complement my collection or current lifestyle. But I admired them all! 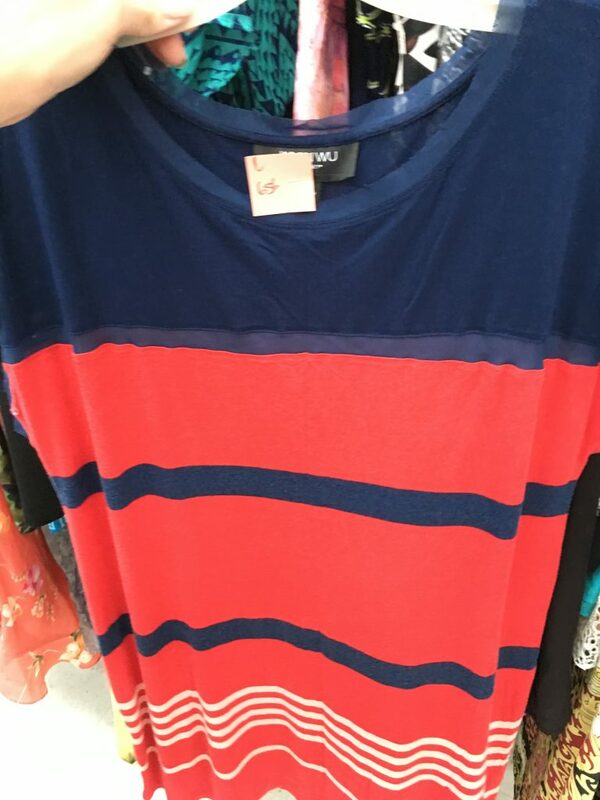 Prices similar to Goodwill. 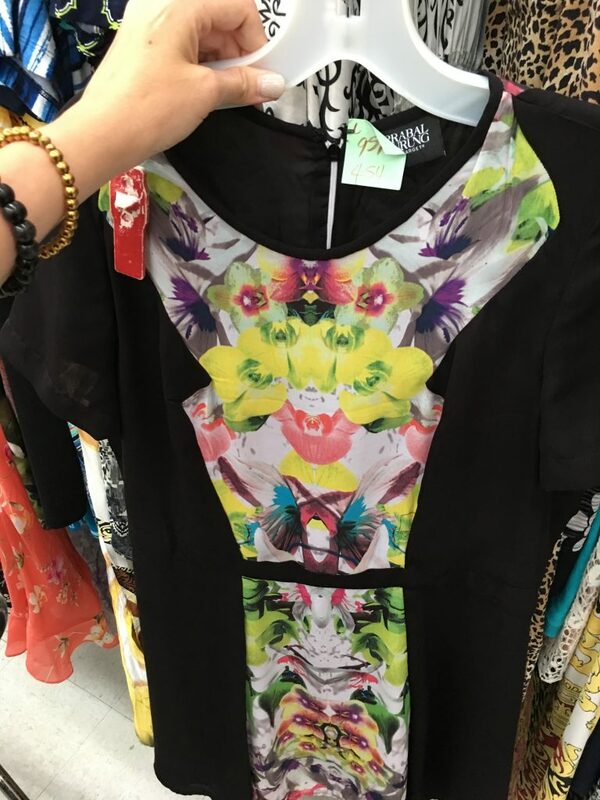 This UK brand dress was so pretty but no pockets and was made of unbreathable polyester. Dang. 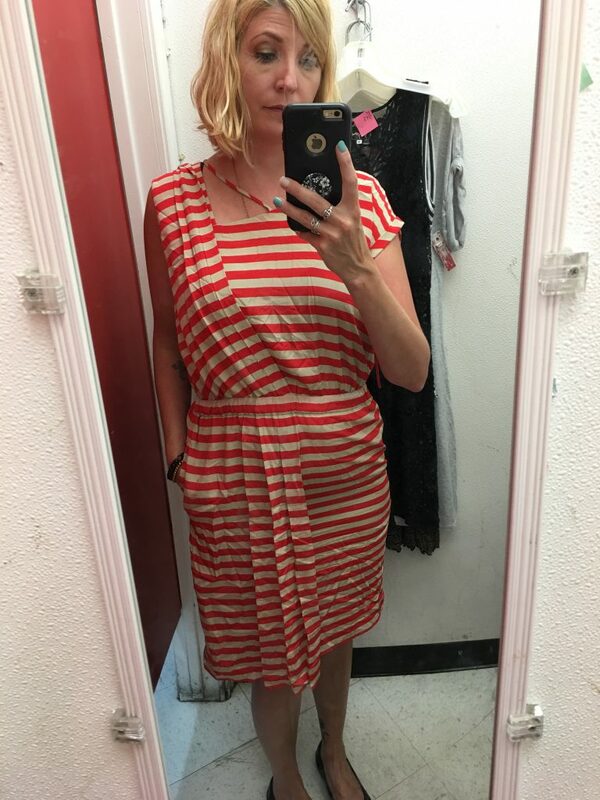 Super cute Everly “dress” – for someone 5 feet tall maybe. Versace coat. VERSACE!!! So very sad it was an XS otherwise it would join my current coat collection which is for decoration purposes only. $7.57. I can’t even. *This* is why there are so many eBay seller these days. 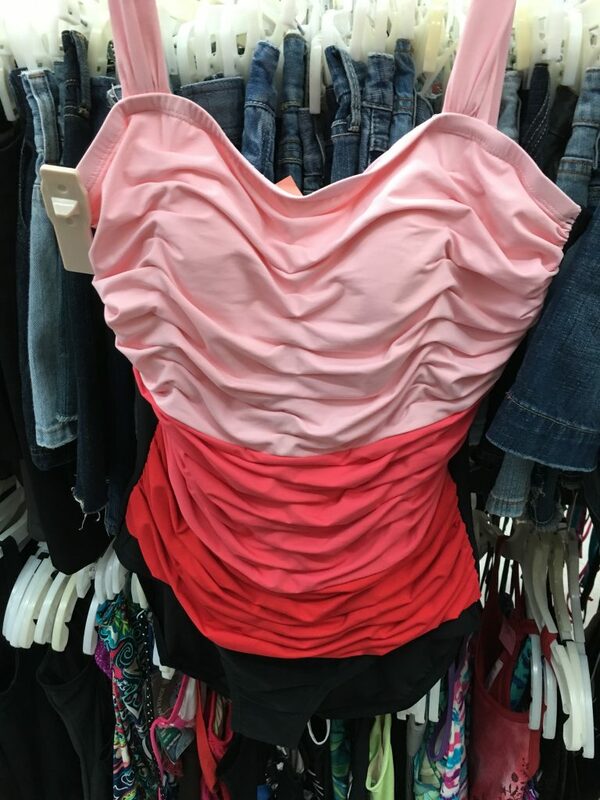 I now routinely scan the bathing suits because I know mine are going to wear out regularly. This one was just a bit big otherwise it would have warmed my Valen-birthday heart! 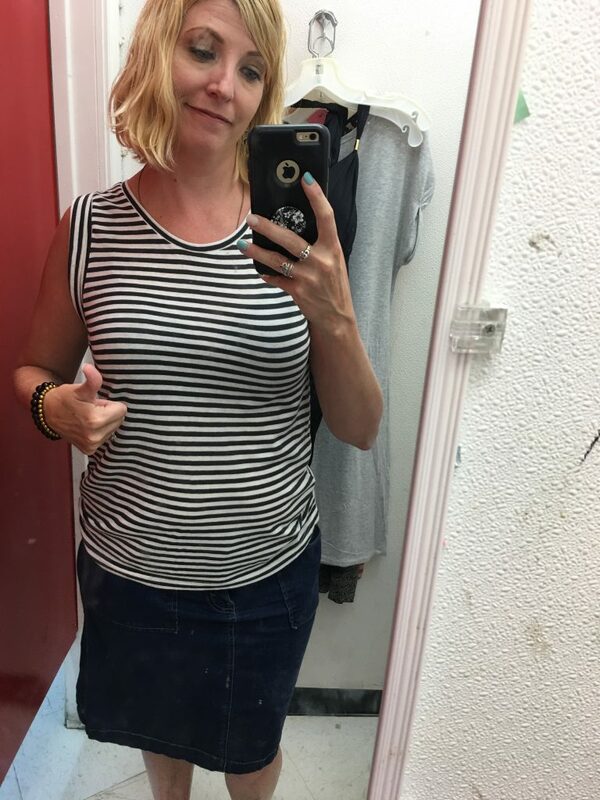 This Family Thrift Center had fitting rooms! I didn’t try on much, believe it or not. Rock ‘n Republic tank. Too big and not quite my style. Now we’re talking! 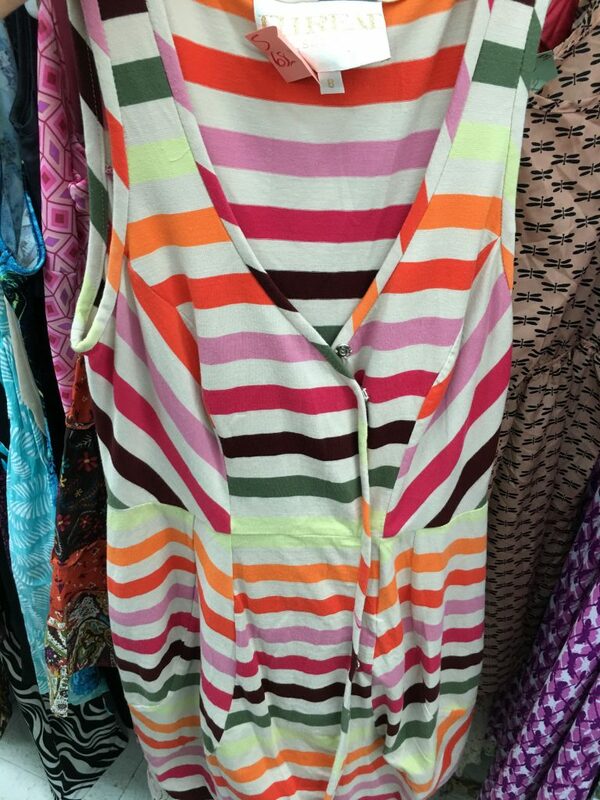 J Crew super soft striped tank for $4.94. 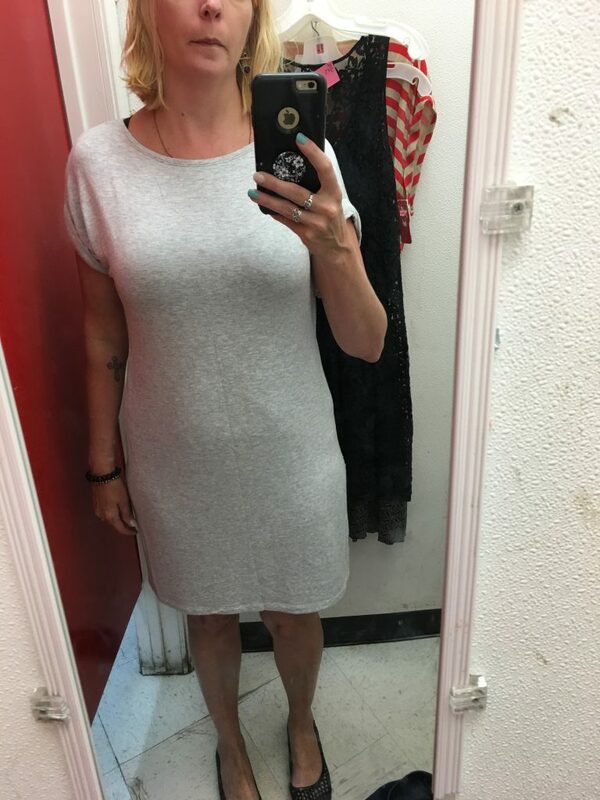 This felt like the softest light sweatshirt ever but it left NOTHING to the imagination and the last thing you want to worry about when wearing a sweatpants-dress is sucking it in. 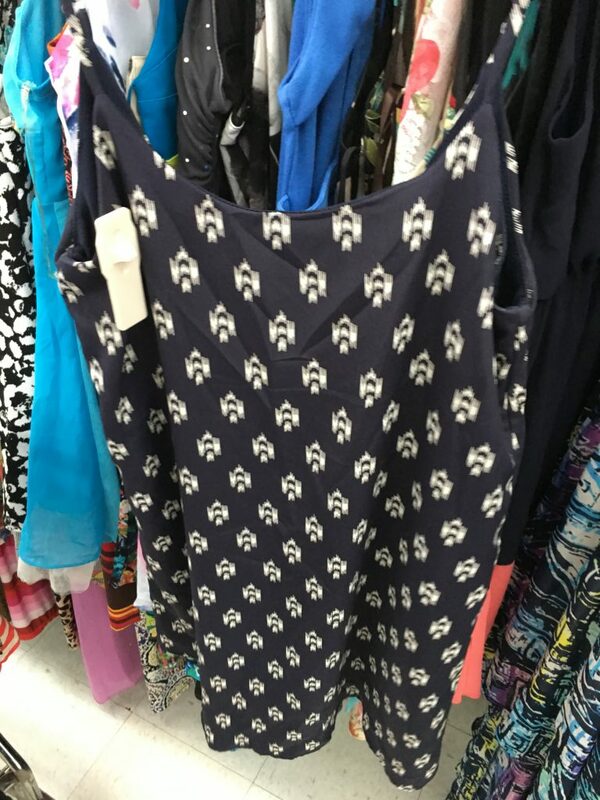 Anthro brand Leifsdottir dress was too small. And a bit Where’s Waldo. Tried on a new Victoria’s Secret swimsuit but alas it was a bit small. 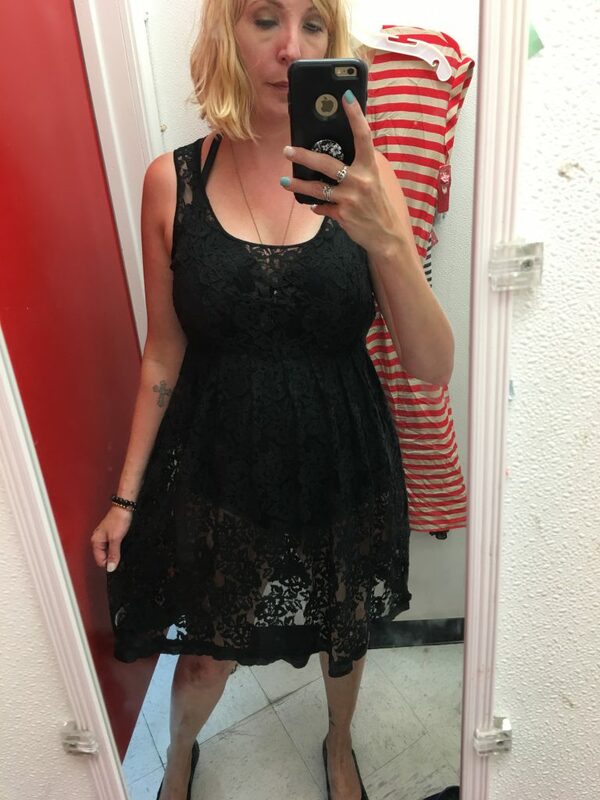 Thought this lace dress might work as a swimsuit cover but really it looks like I forgot my slip. 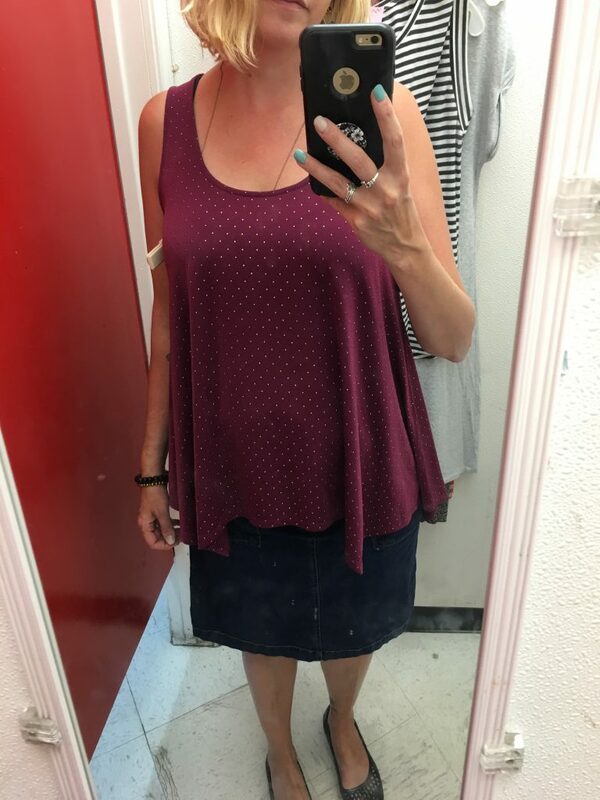 I’m not hip enough to embrace the see-through trend. 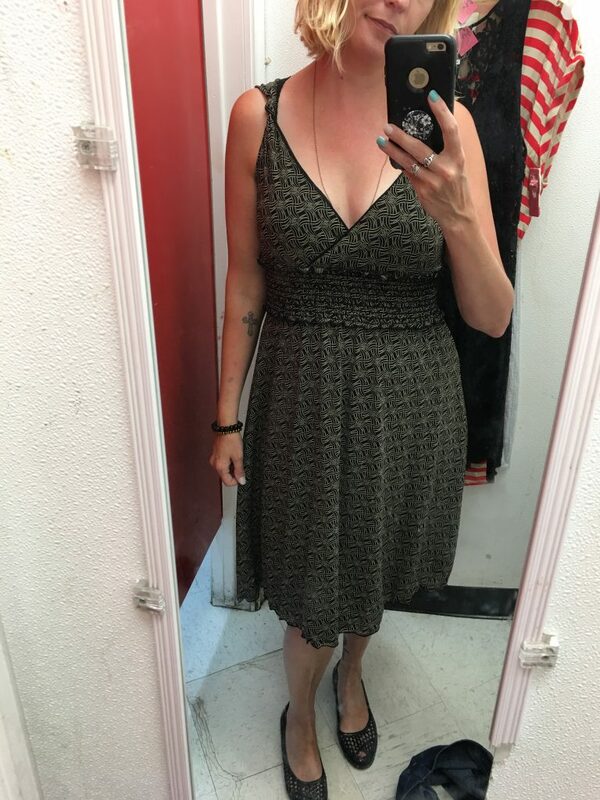 Everyone needs a thrift advisor like mine. 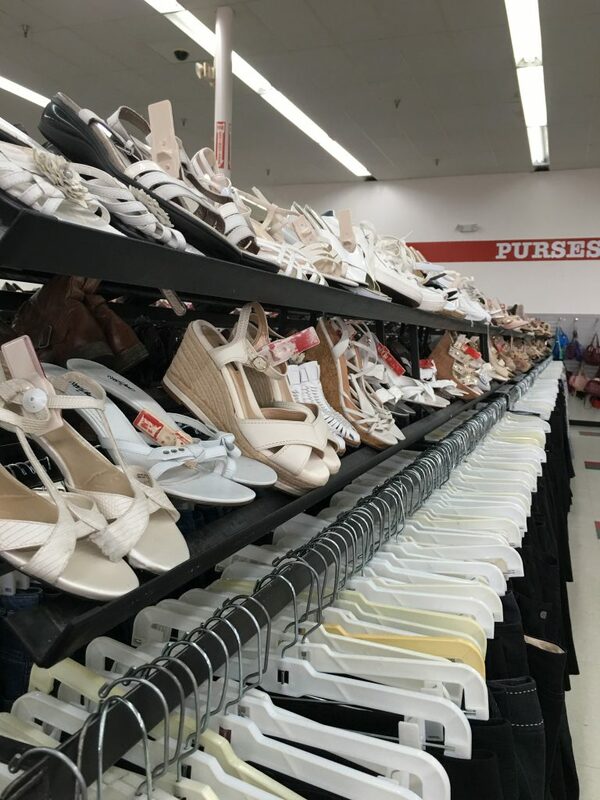 Nine West sandals for $6.56! Perhaps I should invest my savings into a pedicure. 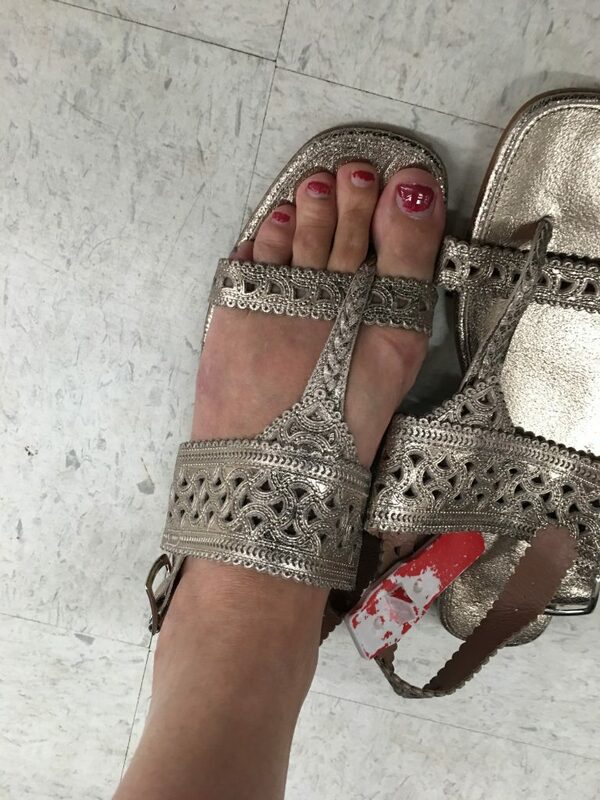 Sigerson Morrison unworn leather sandals $6.56. These retail for around $225! 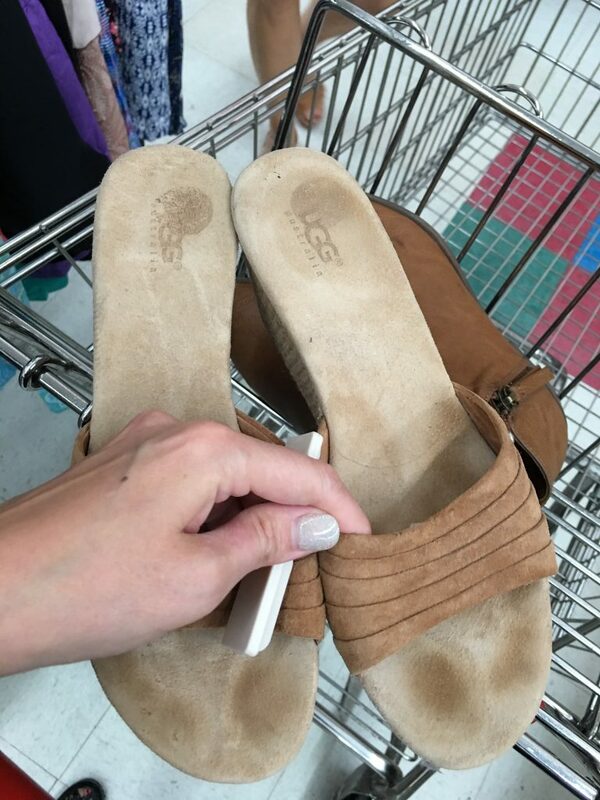 And Ugg leather espadrille slides for $3.93!! YES! 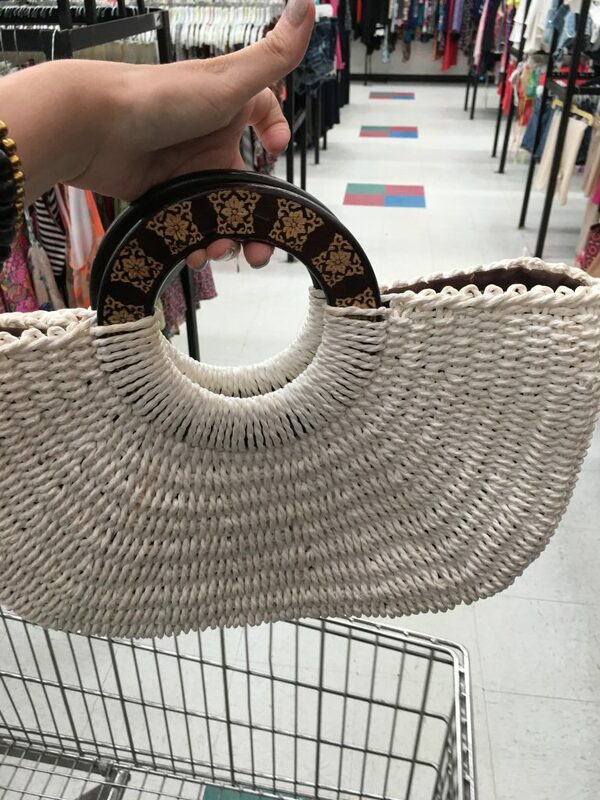 Last but not least, I found a cute bag! 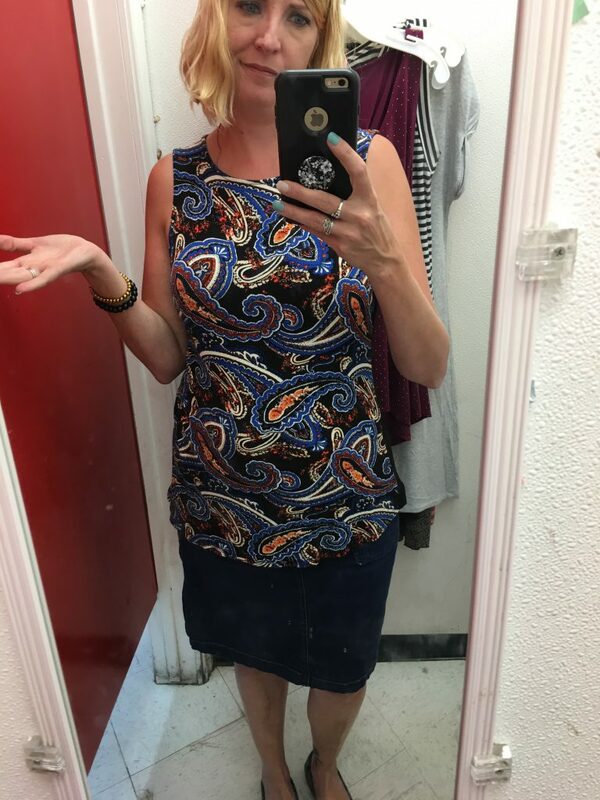 However, there was no price tag and the clerk grabbed it from me and declared that she couldn’t sell it to me because there was no price tag and the managers were on lunch. Excuse me?! I protested four times, literally. “There must be someone here who can put on a price.” No. “That is not reasonable.” (silence) “I’m not able to come back.” (blank stare) “There must be an option.” Finally, she spoke in Spanish to another clerk and neither made eye contact with me when they declared the price to be $6.56. Yes, I’ll take it. 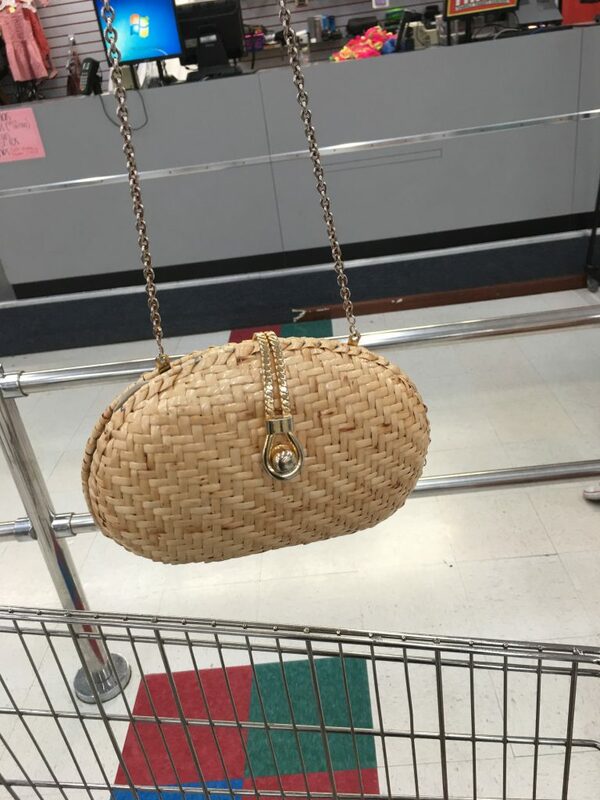 This vintage Vanessa Bruno lacquered wicker clam shell bag IS coning home with me, thank you very much. Sheesh. 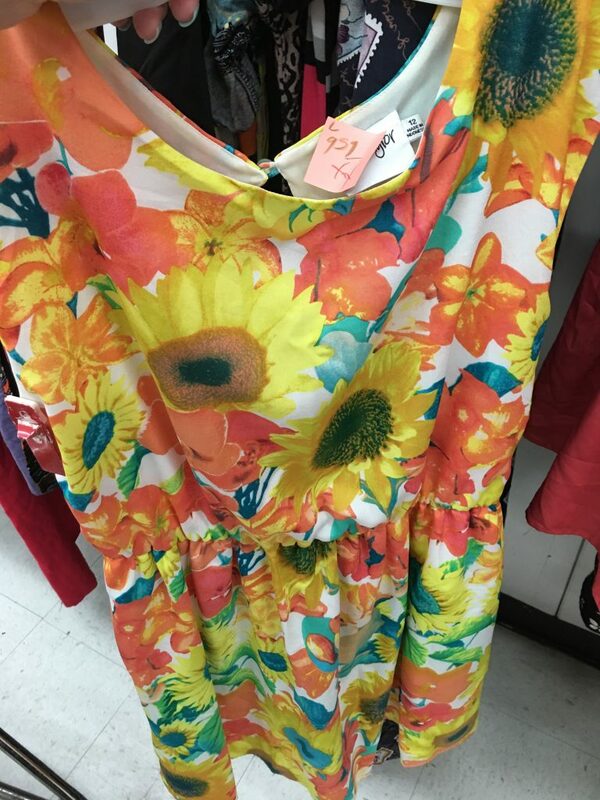 I was NOT pleased with that closing impression of you, Family Thrift Center, and that makes two negative experiences in as many visits for a perfectly nice Canadian thrift enthusiast. I hope this trend does not continue. 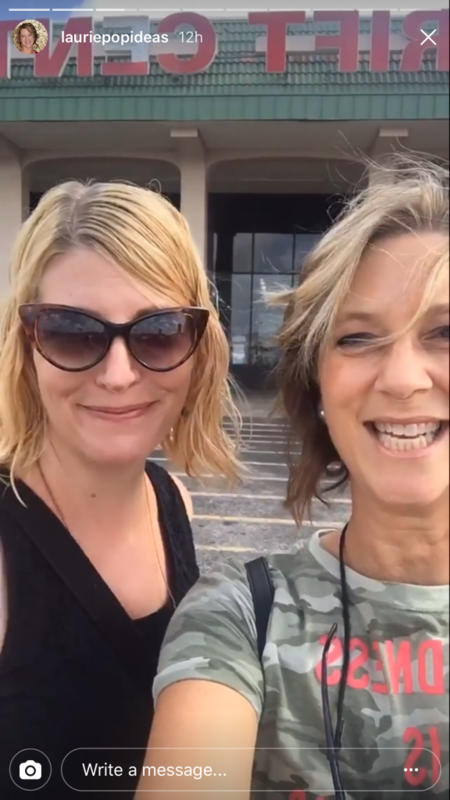 Despite the ending, I had a great time with Laurie – who scored a NWT Anthro tee in the perfect shade of green for $7, check out her IG story for details – and found some great pieces! How about YOU? Did you celebrate this auspicious holiday?!! What did YOU score?! 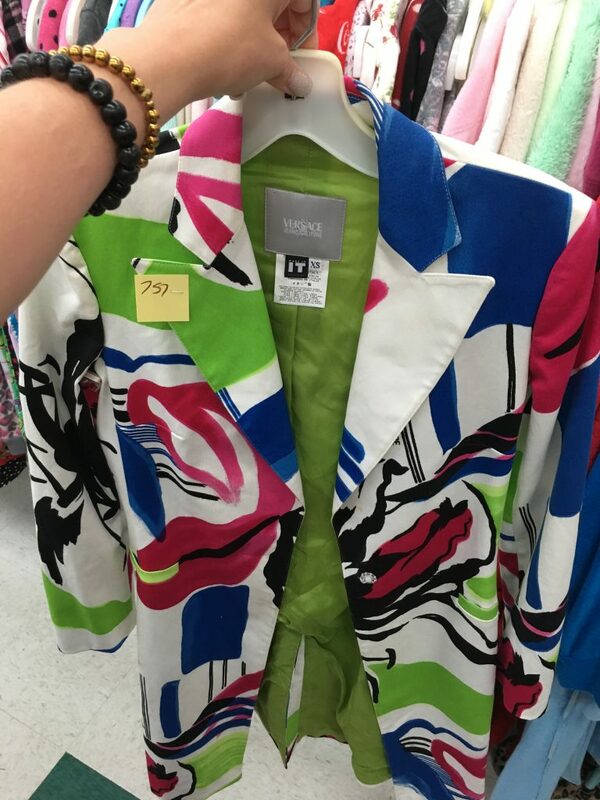 Do share because the victory is all the more sweet when shared with the thrifting sisterhood! Whoa that place looks awesome! Where is this location? I need to check it out! You should check out The Walk in Closet on Mason road. 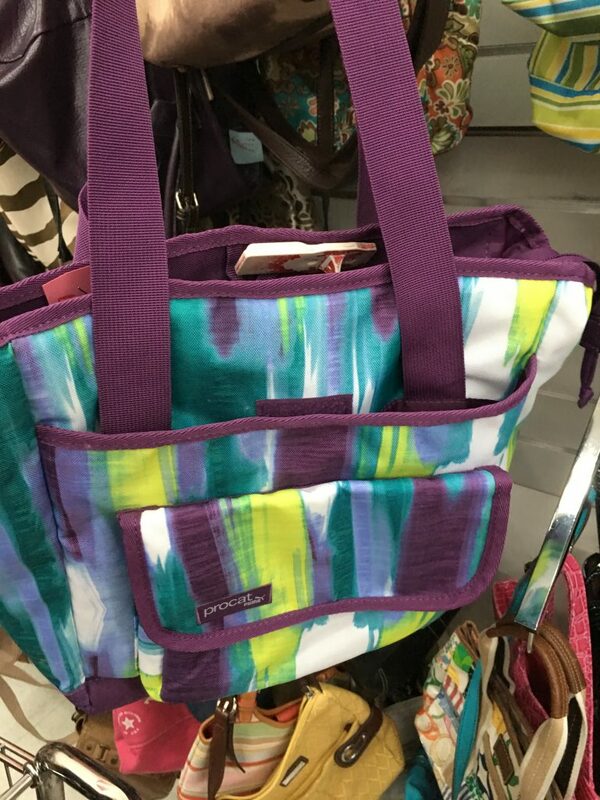 They have really great sales including a 10$ fill a bag sale! I’ve gotten nearly 20 items in my 10$ bag! I follow them on Facebook to find out about these sales. This location was the one just off Hwy 6! Great tip for the Walk In Closet – I haven’t heard of it! I will look it up and check it out ASAP! Hooray for ya’ll! Looks like a great day!